Robots? Coding? Green Screen? Engineering? Contrary to one’s initial reaction, these aren’t topics and technology taught to super-human students of the world of Marvel comics and film. They are all a part of an interactive learning program, called STEAM, taught to regular students, and at A. K. Wigg School. The acronym stands for Science, Technology, Engineering, Arts and Mathematics, and it’s a hot topic in educational strategy. “Have you ever seen a kid do anything for an hour and twenty minutes?” asked Lee Martin, consultant from the District School Board of Niagara (DSBN), and a former recipient of a Canadian STEAM award. The new way of involving technology and innovation in schools makes children “excited,” about learning he said. Martin, along with Kyle Kitchen, also a DSBN consultant, were the guest speakers at A. K. Wigg’s STEAM night last Tuesday, which attracted some 200 parents and students. The STEAM event is a result of a Parents Reaching Out grant of $2,000 that the school received from the Ministry of Education. About two years ago, Principal Mary Zwolak, and Allison Nykolaychuk, chairperson of the school council, held a math night with parents that received a great deal of positive feedback, so with this grant they planned on expanding the idea. The school also held fundraising events and an author’s night, where a former law enforcement officer talked about internet safety. “There are a lot of parents that like to come out for activities and fundraising events that we wouldn’t be able to do without them,” said Zwolak. Similarly, the Parents Reaching Out grant supports parents who want to be able to assist their children better with their homework, and be involved in their children’s education. Zwolak cites interactive learning as one of the best ways to do this. Especially using today’s technology, there are numerous ways to keep children engaged by teaching them to problem-solve, explore and use innovation and creativity to develop solutions. Zwolak said that interactive learning allows the 338 students at A.K. Wigg to improve their communication and interpersonal skills, as they are asked to work in groups and collaborate as a team. If a particular problem doesn’t work out, they learn to “persevere,” especially when it comes to completing math problems, puzzles and games. In retrospect, kindergarten used to be about learning how to tie your shoes, sharing Lego blocks, Tonka toys and complying with nap time. By comparison, today’s kindergarten students are learning a program called “Scratch Robot,” which explores the basics of coding. This program helps children with “different math-thinking, such as problem-solving, map-reading procedures, and it helps to build spacial reasoning and geometry,” noted Zwolak. The interactive learning and technology is also a learning curve for the parents, who develop different methods of relating to, and teaching, their children. The school also has various books and resources in the library for parents to improve their remedial helping skills, so doing homework doesn’t become a dreadful experience. Kyle Kitchen concurs that using technology is, “very different to parents and the way they learned.” These days, teachers want to challenge their children to apply critical thinking concepts in more complex ways. “The kids are not just solving the problems, but learning how to explore the problem,” said Kitchen. “They do it like building puzzles,” he pointed out. For parents taught to refrain from touching anything they aren’t familiar with, today’s educational theories are a far contrast from the past. “It’s the opposite mentality. I tell them to touch and teach and learn,” said Kitchen. During the presentation, Lee Martin reiterated that teaching was about using children’s passions and interests, and apply those qualities to teaching. He said he believed in building “a love for learning,” and a sense of “empowerment” in children. He later showed visual projections outlining how the imagination drove the discovery of robots and various applications for automation and modern progress. At the end of the speaker’s presentations in the auditorium, parents and students moved to different classrooms to participate in other games and examples of interactive learning. While many students don’t meet today’s literacy standards, Kitchen suggested that coding can be utilized in storytelling or digital displays, and the end game is that it encourages children to read. 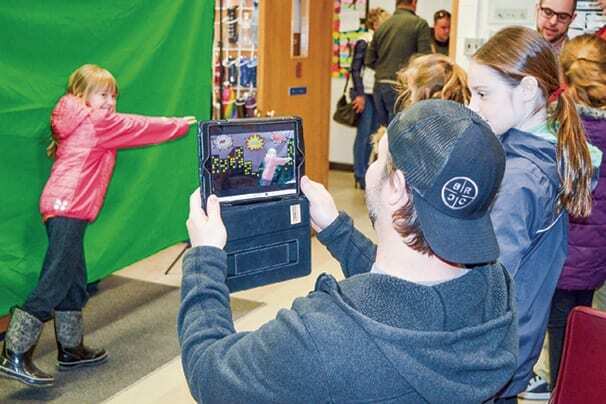 For example: in one of the classrooms, Grades 3 teacher Jaime Young was having the students and children get involved in green-screening, which is a technology used in film special effects. “It’s not as easy as it looks,” said Young. Young offered three fun thematic scenarios: I’m A Star on America’s Got Talent, The Ultimate Superhero Battle, or My Teacher’s Gone Nuts, the last being a surprising option, but definitely one with a wide-range of three-dimensional acting possibilities. Clearly, the parents were just as delighted as the children with this demonstration, and a few of them had souvenir pictures to take home with them on their iPads. Other classrooms had both students and parents playing games, solving puzzles and exploring their inner child, while trying to concentrate on the task. Add in the pizza and snacks, and STEAM is likely to get rave reviews. Since schools and report cards are nearly synonymous, Zwolak asked parents to fill out the survey and score the event, so that they can improve and make the next event better next time around.